There was a buzz around The Bunker Theatre last night for the world premiere of Kevin Armento’s new play Devil with the Blue Dress. In 2018, with Trump in the White House, on the back of one of the most divisive US elections the world has ever seen – one in which deep currents of misogyny were exposed within the American electorate – the time seems ripe for a political play re-examining the events of the Monica Lewinsky scandal twenty years ago. Similarly, at a time when women across the globe are again challenging patriarchal power, it seems right to have this story told by an all-female cast. Unfortunately, the promise of the piece is undermined by the lack of theatrical imagination in this pedestrian production, which even the beautifully played live saxophone underscore (credit here to the saxophonist Tashomi Balfour) failed to invigorate. The play opens with Hillary (Flora Montgomery) drawing our attention to the nature of theatre, and to the nature of the narrative we are about to witness. She says ‘theater [sic] is the art of the impossible’ which sets the expectation for a creative theatrical language which this production notably lacks. The play is dialogue heavy and physically static, and despite the energy of some of the performers, most notably Kristy Phillips as Chelsea and Daniella Isaacs as Monica, this most turbulent tale never feels truly alive, and would have benefitted from the skills of a good movement director. Flora Montgomery was well cast as the whip smart and emotionally controlled Hillary, though her moment of breakdown felt curiously detached. All in all, the considerable talents of the cast felt underused, and the characters felt constrained rather than released by the writing. Dawn Hope as Betty, and Emma Handy as Linda, clearly had more to give performatively than this script and its realisation allowed them, and it seemed somewhat ironic that, when given their voice, four of the five female characters spent much of their time speaking the words of the President. Similarly, the chaotic cacophony towards the end of the second act – ‘the four of you, clawing, and conniving, and deceiving each other’ as Chelsea describes it in the script – belittles the complexity of these women’s collective experience in a way that runs counter to the exposition of their story. 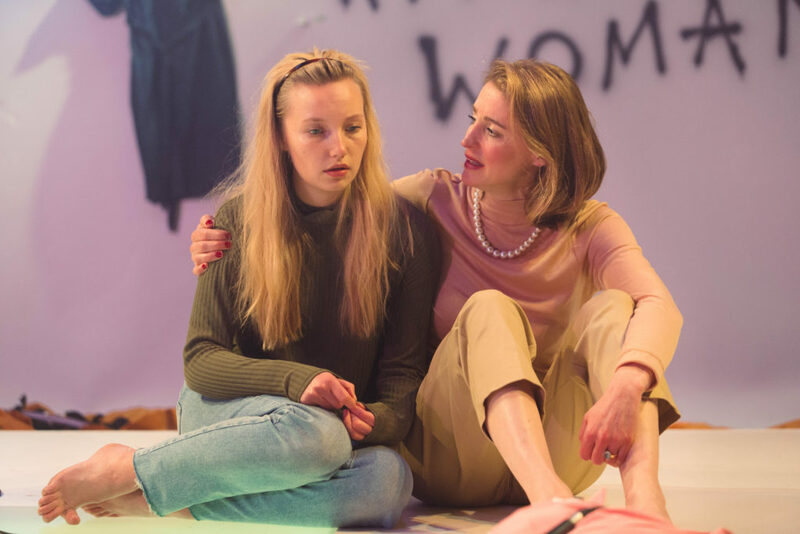 Towards the beginning of the second half of the play – Article Two: Obstruction of Justice – Linda says ‘if you look past all the scenery and the subterfuge here … this is just another story of mammalian urges’. And that is indeed what we were left with – another unedifying tale of a powerful adulterer. The larger dramatic canvas was left unexplored, and the fuse of a potentially explosive evening remained unlit.